On October 4th, 2009, Japan hosted it’s annual round of the Formula 1 Japanese Grand Prix. For those of you who have been reading this blog, last year, I also attended the Japanese Grand Prix. This year was a little different. After two years at Fuji Speedway in Shizuoka, the Japanese Grand Prix moved back to its traditional home of Suzuka Circuit in Mie Prefecture. Mie is located south west of Tokyo. The closest major city is Nagoya, but you can still access Kyoto and Osaka from Suzuka. By and far, the easiest and most common way to reach the circuit itself is to leave from Nagoya. The biggest difference between Fuji Speedway and Suzuka Circuit is the owner. Fuji is ultimately owned by Toyota, while Suzuka is owned by Honda. The two car giants of Japan competed for the rights to hold the Japanese Grand Prix for the last three years. From this year, the plan was to alternate between Fuji and Suzuka. Next year’s race was supposed to be held in Fuji. Unfortunately, due to the downturn in the economy last year, Fuji decided to not hold the race in 2010, so Suzuka stepped up and will hold the race in Japan for the next few years. 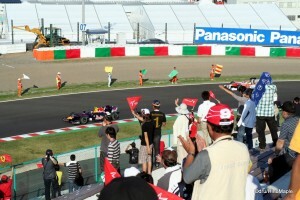 Many of the drivers were very happy about this, but what about the fans and the Japanese people themselves? While a lot of people don’t really care, race enthusiasts were always happy to hear that Suzuka won the race. It is one of the very few figure 8 circuits in the world, and the only one on the F1 calendar. It is steeped in history that, while not as old as Fuji, is more prestigious. 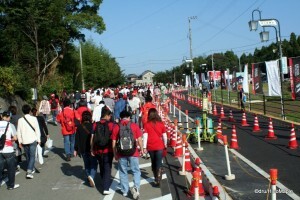 Crowds heading to Suzuka Circuit on race day. Accessing and retuning home from Suzuka Circuit is very easy. From Nagoya, it’s a simple reserved express train from Nagoya Station to Suzuka Circuit Inou Station. You can also purchase reserved tickets to get back to Nagoya. While this may be a little expensive compared to the regular trains, it guarantees that you’ll have a seat, and when you return to Nagoya, that may be very important. When you do reach the station, it’s very easy to find your way to the circuit. Just follow the groups of people and you’ll be fine. While it may be different in future years, be sure to pick up a map and ask the staff for some information to make sure you know your options. If you want to play it safe, just return to the same station. The second option is to take the Kintetsu trains to Shiroko Station. It’s about 5 kilometres away from the circuit, or an hour walk. There is a shuttle bus, but it can take up to an hour to wait for it. Many people enjoy a nice walk in the countryside to get to this station. To reach it, you must also walk past the Inou. The main advantage of walking to Shiroko is that trains come more often than at the Inou station. When leaving Nagoya, don’t worry too much about buying tickets. You can easily buy them at the main entrance as there will probably be a table set up for selling return tickets. Just be sure to know which tickets you need before leaving. Hundreds of photographers both professional and hobbiests hard at work. When entering Suzuka circuit itself, it’s evident that Honda’s circuit company knows what it’s doing. It has held the F1 event and other major world sporting events for years. The F1 event itself is very similar to the one in 2008, but there are noticeable differences. The first is that the party is slightly bigger, yet more compact. In Fuji, everything was spread out a lot more. Suzuka’s main entertainment area was behind the main grandstand, and there wasn’t a lot going on outside of that area. Of course, you can always buy the basic souvenirs around the course, but there were fewer opportunities to do so. However, buying food was ten times better in Suzuka. The options were slightly limited, and it wasn’t the cheapest food in the world, but it was good and reasonable for a world sporting event. The major plus is the number of activities that are available for children. 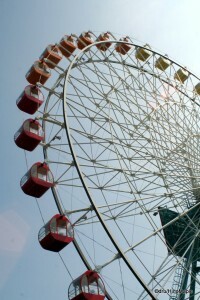 There is a large ferris wheel, and other various amusement rides that are centred for children. 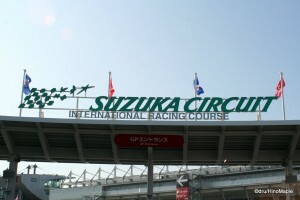 Suzuka, being Honda’s signature track, has a better amusement area compared to Motegi. There are various boat rides, and roller coasters. There was a go-kart track, but this was closed to add more space for exhibitions. Overall, I’d prefer Suzuka over Fuji, and most Japanese people would tend to agree. Fuji’s major advantage was being close to Tokyo. Looking at the race, it was your typical F1 race. I had the chance to enjoy the event during qualifying for the first time. It was a nice event, and qualifying made walking around the main areas easier. It was extremely busy on race day, so if you can enjoy the Saturday qualifying, be sure to do your shopping then; don’t wait until race day or things will be sold out. Qualifying was riddled with accidents, and the race itself wasn’t that exciting. In typical F1 fashion, there were several passes on the first few laps, but after that, it was a war of attrition. Everyone kept circling the circuit and any passing was done in the pits. By the end of the day, Sebastian Vettel won the race with home team Toyota’s Jarno Trulli in second. Bringing up the last spot on the podium was McLaren’s Lewis Hamilton. This entry was posted in Motorsports and tagged Aichi, amusement park, cars, F1, f1 car, Ferrari, ferris wheel, figure 8 circuit, Formula 1, Formula One, Grand Prix, grandstand, Honda, japan, Japan GP, Japan Grand Prix, Japanese, Japanese GP, Japanese Grand Prix, Jarno Trulli, Kintetsu, Lewis Hamilton, McLaren, Mie, Nagoya, race, racing, Red Bull, roller coaster, Sebastien Vettel, Shiroko Station, shuttle bus, Suzuka, Suzuka Circuit, Suzuka Circuit Inou, Suzuka Circuit Inou Station, tokyo, Toyota, world sporting event, 名古屋, 愛知, 日本, 日本GP, 鈴鹿, 鈴鹿ｆ１ by Dru. Bookmark the permalink. Great article, i had the pleasure of being at Suzuka this year! Thanks. Are you going next year? Schumacher will be there now.